His rescuers named him Saturday (Shabbat), for on that day, his life began. One of many work horses in Jaffa, the old part of Tel Aviv, he hauled a cart loaded with fruits and vegetables to and from the market. People saw him there often, but no one knew the dark side of his existence. What food he was given was mostly what remained of the unsold vegetables. On non-work days, he wasn't fed. Weak from hunger and malnourishment, he strained his body beyond its limits pulling the heavy load. Repeated falls caused deep wounds on his legs. His ill-fitting harness was meant for a donkey, not a horse. It had pulled away the skin from under one foreleg and caused a painful sore on his shoulder. Every part of his body ached, not just from pulling a load that was too heavy for his frail, undernourished frame, but because of regular beatings at the hands of his guardian. Scars covered the length of his body. Unwashed and kept in a filthy stall, he smelled of excrement. To prevent him from toppling the cart when on an incline, small blocks of wood were nailed to his cracked and broken hooves. Underneath the wood were fungus and blood clots. Every step he took was agony. Constant pulling of already overused muscles left him unable to lift his left hind leg properly when walking. Didn't any passersby in the market ever notice his wounds or see him fall repeatedly on the pavement, unable to carry the cart one more step? There was barely any flesh covering his protruding hip bones; why did no one register a complaint or intercede in any way? Tel Aviv's municipal vet, Zvi Galin, was responsible for inspecting the horses in Jaffa and had the ability to confiscate maltreated horses. Why had he stood by silently, allowing this mistreatment to occur? Saturday's fate might have been the same as that of other cart horses in Jaffa, Jerusalem, and elsewhere in Israel — used during the summer months and later abandoned to starve, or sold for horse meat when he was too weak to continue. But one Saturday in June, 1999, his destiny was changed. Donations from caring CHAI members made it possible for CHAI's Director, Nina Natelson, to go with the head of the SPCA Shomron, Sharon Plotkin Zylberman, into the drug and crime-ridden area where this once probably stolen horse was kept in a small, filthy stall. Despite being threatened and cursed, they bargained for his release. On that day, a trailer carried him away from the squalor and misery in which he had spent most of his first six years and toward a new destiny. The first thing Saturday did when getting out of the trailer was to roll on the ground in the paddock and rub himself clean. Once properly washed, he was examined by a vet who said that he was at least 250 pounds underweight and could not have survived much longer. The farrier who removed the blocks of wood attached to his hooves and treated the fungus underneath refused to accept payment for his services. The vet, also, would only accept a greatly reduced fee. Finally, Saturday was gently brushed, massaged, and given nourishing food. Throughout the process, he stood motionless. In his experience, any resistance would result in a beating. His overwhelmingly sad eyes seemed to be focused elsewhere. The fresh, healthy food put before him was left untouched. Although he was clean and no longer forced to pull a weight beyond his capacity, every inch of his body hurt. Only when the vet injected him with painkillers was he finally willing to taste some fresh hay. Grazing is the most natural thing for horses, but it was a pleasure Saturday had been denied. Every time he reached out his neck to bite off a piece of something green, it was brutally yanked back. When he was finally taken out to graze to his heart's content, his face registered his astonishment. He blew air through his lips, a sigh of contentment. Saturday was placed in a fenced yard surrounded by greenery, together with a small Welsh pony named Cockleshell, who acted as a therapist for the other horses. Soon, he and Cockleshell were friends, standing for long periods of time cheek to cheek, nose to nose. Healing was clearly taking place. Since Saturday was released from hell, he has gained weight and his ears no longer go back in fear at the approach of a human. Instead of a beating, he has learned it might mean an apple, a walk around the paddock, or being taken out to graze. He enjoys the company of other horses. He still drags his left hind leg behind him when he walks. The vet thinks all the physical sores will heal, though the scars on his body and in his psyche will remain. But Saturday is learning to trust again, to receive love, and that the world can be filled with pleasant smells, tastes, and feelings. The people who agreed to transport him thought they would only be providing temporary boarding. Now, they say, they never want to see him go. He has a real home, at last. Saturday has been given back his birthright — to live and enjoy life as a horse — and he is learning to do just that. Saturday's abuser has other horses who are being subjected to the same treatment — starvation and beating. Now that he sees there is interest in his horses, the abuser has doubled his asking price. 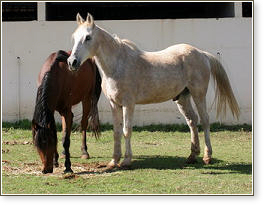 Hakol Chai's repeated appeals to Tel Aviv municipal vet Zvi Galin for help with removing these and other abused horses from their guardians have been ignored. Hakol Chai has appealed to Knesset member Avraham Poraz, the sponsor of the Animal Protection Law, and to the Mayor of Tel Aviv. In the hope of exposing the situation on TV, Hakol Chai has provided a public relations person with video footage of starved mother and baby horses standing in garbage, which puts them at risk of contracting tetanus and botulism, to which horses are especially susceptible. Hakol Chai is also calling for a ban on horse-drawn vehicles. We will continue to pressure officials until action is taken. Please see Horses Removed from Extreme Abuse for more information about Saturday's abuser. Saturday enjoyed 15 years of care and companionship in retirement on a farm in central Israel. He passed away this month after a short illness.